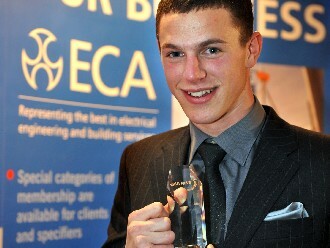 Langholm electrician Richard Sagar, 22, ensured another gold medal headed back to the north from the 2009 WorldSkills Championships, widely regaded as the Olympics for tradesmen. Richard's success in the Electrical Installations category came two years after Longtown cabinet-maker Gary Tuddenham was named the best at his craft. Richard, who lives in Langholm's Parliament Square and is currently plying his trade for T Graham& Sons Langholm, was one of just three British gold-medalists at hte biennial event, held this year in Calgary, Canada. And it was a hard-fought contest, with the young electrician battling it out against 31 other nationalities in one of the toughest categories at the championships. Richard who will fly home on Saturday, said: " The competition was unbelievable. It was a testing experience - hard work. There were no easy days. It was non stop.
" It was an unbelievable experience. The closing ceremony had 7,000 people at it. It was an unbelievable atmosphere - a once-in-a-lifetime event.
" I'm still taking it all in. I don't know what to feel. Its really special." The award means that Richard has earned himself the right to call himself the 'best electrician in the world' although he expects to be brought back down to earth when he returns to Langholm. He added " I think I will probably get some ribbing when I get back." In total, the competition saw 900 competitors from 46 countries prove their worth, in everything from autobody repair to floristry. Britain was represented by a team of 26, all under 25, who picked up three gold medals, six bronze medals and 14 medallions for excellence, awarded to everyone who achieved 500 points in their category - considered to be world-class standard. Simon Bartley, chief executive of UK Skills, which manages team UK, said: "What Team UK has achieved is outstanding.
" they have all worked so hard to get where they are and that has certainly paid. Once again we have shown that we have the very best young talent in our country. "its a tremendous result not just for the competitors, but for their employers, trainers and colleges." This year saw Richard Sagar, employed by Eden Electrics Ltd and trained by the Scottish Electrical Charitable Training Trust (SECTT), crowned the UK SkillELECTRIC champion. 21-year-old Richard competed against nine others from all over the UK, undertaking a series of practical tests that demonstrated their abilities and highlighted their outstanding skills. Visitors to SummitSkills’ stand watched the action unfold as contestants from England, Northern Ireland, Scotland and Wales faced a series of demanding practical tests based on real-life work situations, including installing units, power circuits and cabling to a high specification, and within tight timescales. Marks were awarded for the candidates’ ability to complete the design, installation and commissioning to an international competition standard with due consideration for health and safety, and the environment. The SkillELECTRIC UK finals culminated with a prestigious awards ceremony held at the National Motorcycle Museum in Birmingham on Tuesday 28 October. MP Claire Curtis-Thomas and Diane Johnson, Vice President of the Electrical Contractors Association, joined SummitSkills to help present the prizes. The best competitors from the UK finals also have the chance to compete alongside other team-mates in the WorldSkills competition. The biennial event is the largest skills competition in the world and attracts around a thousand contestants from over 50 countries. The next event is in Calgary in 2009.